Color is central to the design of my hand-crafted jewelry. 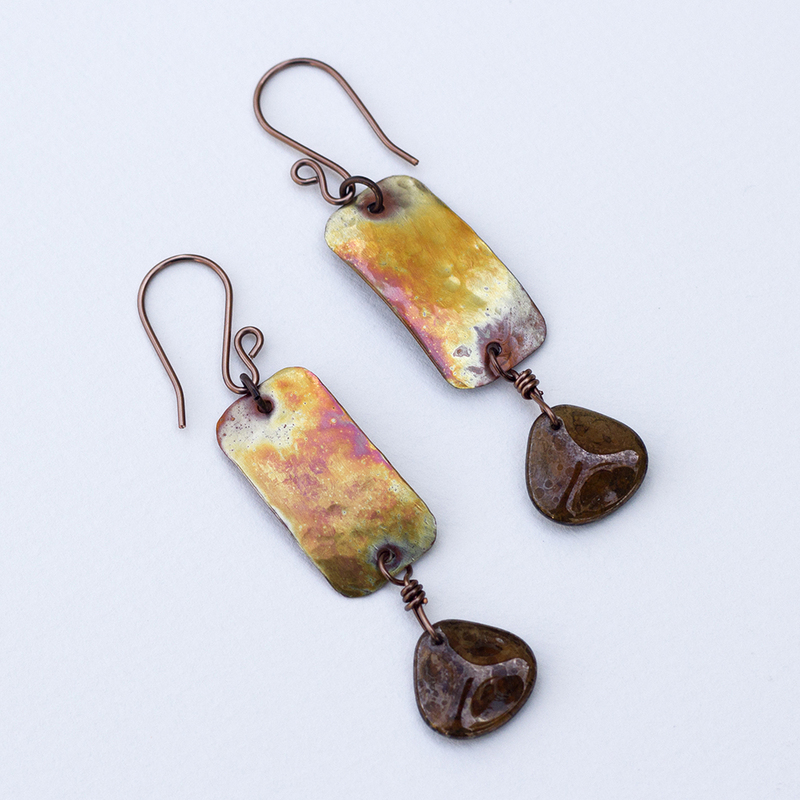 A featured hand-blown glass or hand- made ceramic bead is combined with beads that complement and enhance its colors. 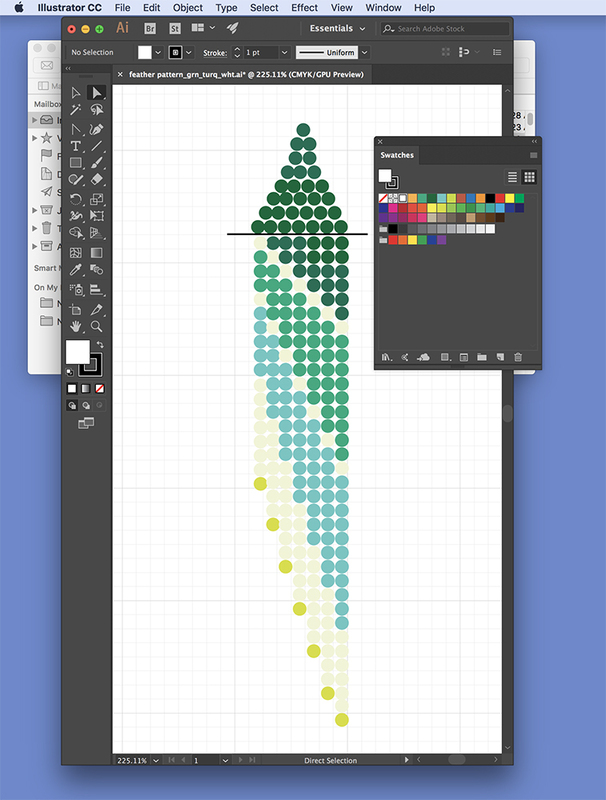 Woven beaded bracelets and earring patterns are designed in Adobe Illustrator, using bead colors for my palette. 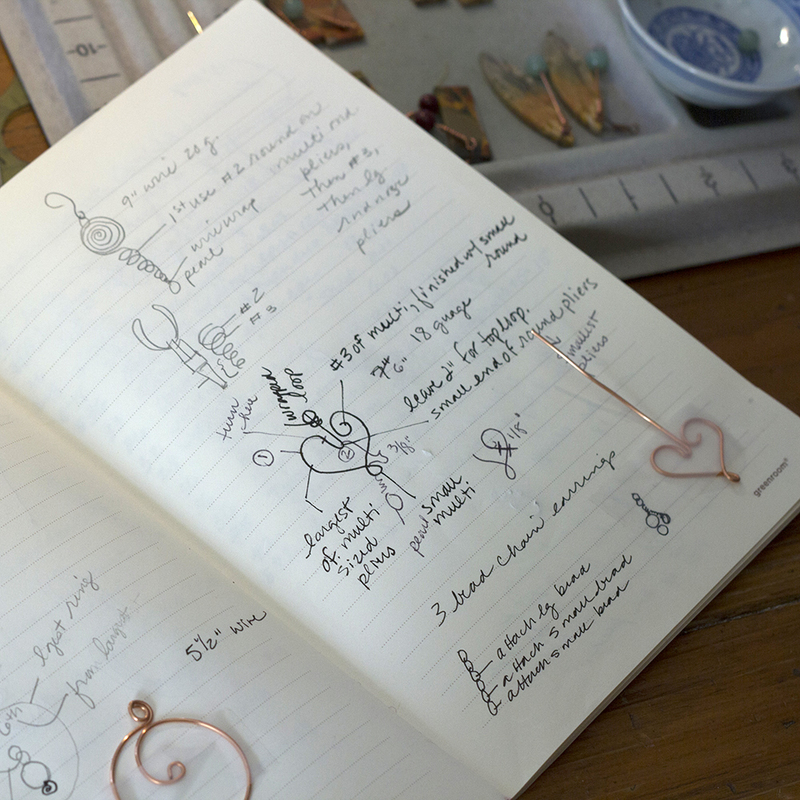 I also hammer silver or copper into interesting shapes for earrings, and torch the copper for a color patina. The elements in a finished piece should work together harmoniously, but I like to add a visual surprise every now and then. 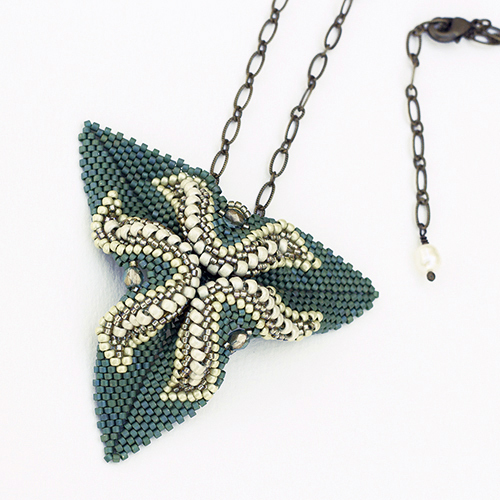 I am also a graphic designer and find jewelry making to be intuitive and rewarding. I often begin by sketching, then play with materials to create what I have in mind. A piece usually evolves, moving away from my initial idea to something suggested by the materials. Here are three process photos. One shows a sketchbook, where I not only sketch ideas, but paste models of shapes, noting sizes, tools to use, etc. 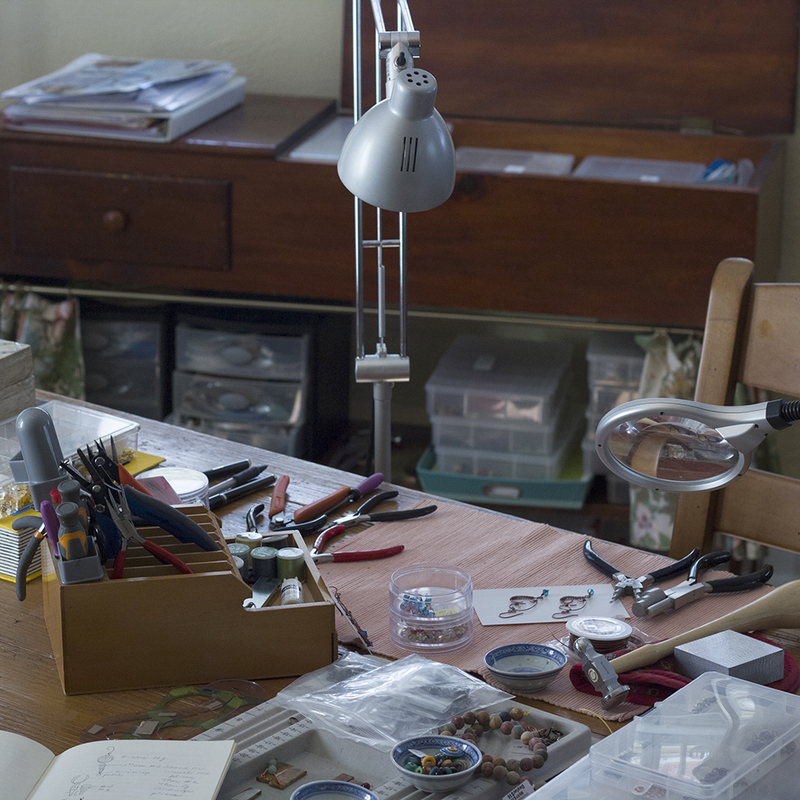 The workspace photo shows the table where all jewelry making takes place. Behind the table is an old bench, where where beads are stored according to color, along with wire, cord, metal plate, etc. 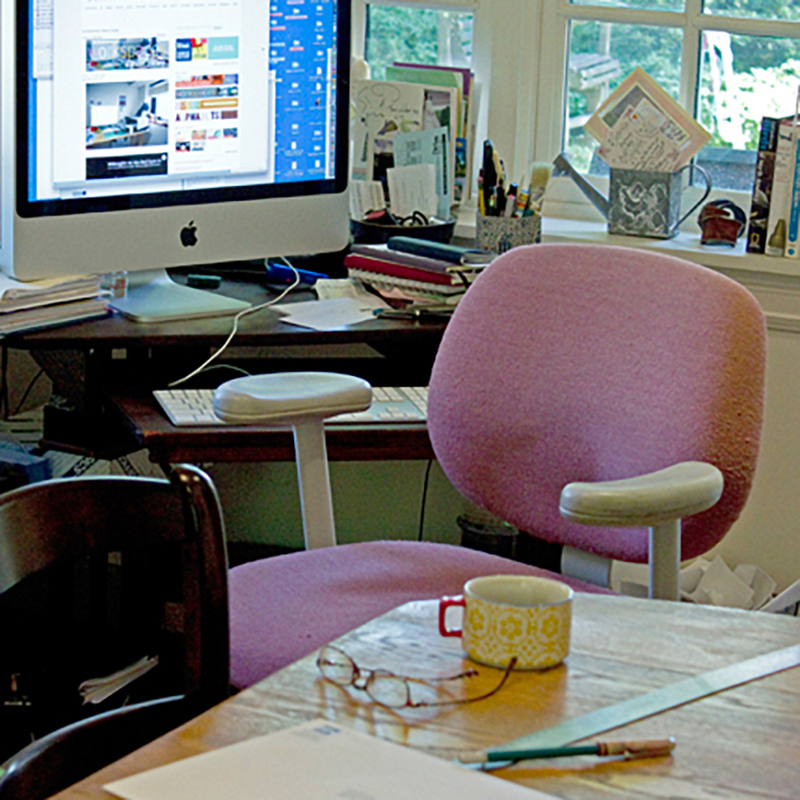 The studio with the iMac is where I design beading patterns in Adobe Illustrator, converting bead colors to palette colors, and also where I load photos of finished jewelry onto my Etsy site. Here are examples of my designs as I interpret them on Adobe Illustrator. I shop locally for materials at Blue Santa Beads. At Bead Fest, a huge wholesale market, I look for my favorite bead artists, especially glass and lampwork artisans. I like to travel, looking for bead shops wherever I happen to be. One May I went to Thailand and China. On one 105-degree afternoon in Bangkok, I shuffled through the maze of the Chatuchak market, where I eventually found beads from Nepal and Tibet. In Morocco I found amber at a reasonable price. I became a little better at bargaining in China and Morocco. I enjoy meeting the people who buy my jewelry. It is great fun to spend time making something, and then watch someone pick it up and try it on. Happy shopping!